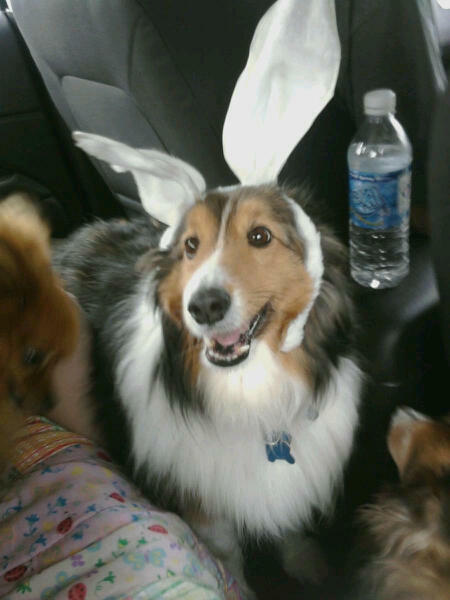 Last night my dear Aunt Vickie and her family helped their sweet Sheltie Jimmy cross the rainbow bridge. He was a noble and darling little guy. After the adorable little Pomeranian’s had a litter of puppies; Jimmy was on standby to make sure ever whimper and whine was attended to. He loved his girls too, never very far from my cousins. But his true loyalty was with my Aunt; he would keep her company in the kitchen; lay by her feet and make the rounds at night see to her comfort. Rest tonight without pain sweet Jimmy. moment. Very stressful, so we know how Jimmy’s family feels. That twangs the heart strings. Quite often it is easier to loose people than best friends. Rest In Peace, Jimmy ………. oh sad. My husband’s last dogs (several of them) before we had Jake and Albert were all shelties. He loves them for their loyal friendship. My daughter had to send her 13 year old dog, Delilah, over the bridge on the same day as Jimmy. Maybe he and Delilah have already become fast friends. Jake and Albert send Scottie hugs. Peace out, sweet Jimmy. That is one sweet little guy. RIP sweet boy and condolences to the family we hope that in some way knowing he’s no longer in pain brings them comfort along with the wonderful memories. thank you to all the people who left messages about Jimmy. He was such a wonderful pet to our family. He is missed so much, we pulled his stocking out of the Christmas decorations yesterday and it won’t be the same holiday this year. What a beautiful boy, my condolences on your loss. I can’t even imagine what the experience must be like. You have a wonderful little angel watching over you now.